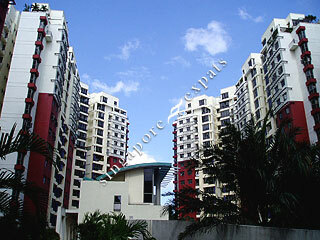 The Florida is a executive condominium located in the heart of HDB heartlands, Hougang HDB housing estate. It is CDL's first executive condo project and like a condominium, it has full condo facilities. Located near to Punggol Park and Sungei Serangoon (Serangoon River), high floor apartments will enjoy beautiful view of the nature. The Florida has many nearby amenities located around the condominium. Frequent flyers can use the nearby Tampines Expressway (TPE) to the airport which is around 15 minutes away. Nice quite place for families.